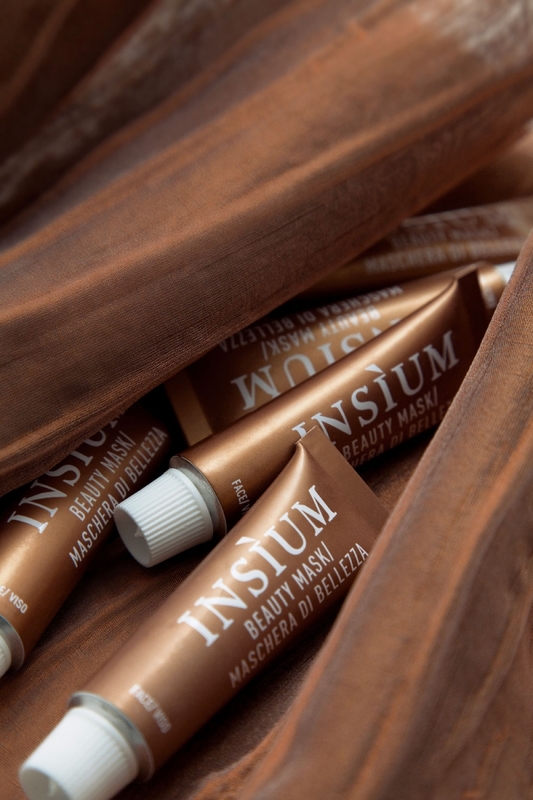 THE INSÌUM BEAUTY MASK PROVIDES AN INSTANT BOOST OF NOURISHMENT AND HYDRATION DEEP DOWN. ITS ULTRA-RICH, SENSORY TEXTURE BLENDS INTO THE SKIN FOR AN ALL-ROUND ANTI-AGE TREATMENT. IT LEAVES SKIN FIRMER AND MORE ELASTIC, IT NOURISHES INTENSELY, AND IT REDUCES IMPURITIES AND DILATED PORES, PREVENTING AND ALLEVIATING THE EFFECTS OF TIME. PERFECT SKIN IN ONE GO. Neuroguard, Trifluoroacetyl Tripeptide-2: all-round anti-age action. Avocado Oil, Macadamia Oil, Shea Butter: with a synergistic nourishing and elasticizing action that works deep down, hydrating, repairing and protecting the skin from dehydration and environmental stress. Plant ceramides: an active ingredient that has an intense repairing, protecting and redensifiying action deep down, helping to reshape the oval of the face. Red Clay: packed with minerals and micro-elements, it has detoxing, soothing, elasticizing and toning properties. It leaves the skin fresh, even and revitalized. Alginate: brown algae extract with powerful hydrating and toning properties. Distilled Witch Hazel Water: with the help of its recognized soothing and refreshing properties, it calms delicate skin, tones, and supports hydration. SUITABLE FOR ALL SKIN TYPES, IDEAL FOR DRY, STRESSED SKIN LACKING TONE AND WEAKENED BY ENVIRONMENTAL STRESS. THIS MASK DOES NOT CONTAIN: PRESERVATIVES, SILICONES, COLORANTS, MINERAL OILS, ANIMAL PRODUCTS, PARAFFIN, PETROLATUM, PEG OR PPG, PETROLEUM JELLY, NANOMATERIALS, PROPYLENE GLYCOL, DEA OR TEA, ALCOHOL, EDTA, CHEMICAL FILTERS, ACRYLATES OR SULFATES. Apply once or twice a week on clean skin on the face, neck and décolleté. Massage in gently, leave for at least 20 minutes and rinse off with plenty of water. Proceed with your usual treatment.